460 Beacon is located on the north side of Beacon, between Hereford and Massachusetts Avenue, with 458 Beacon to the east and 462 Beacon to the west. 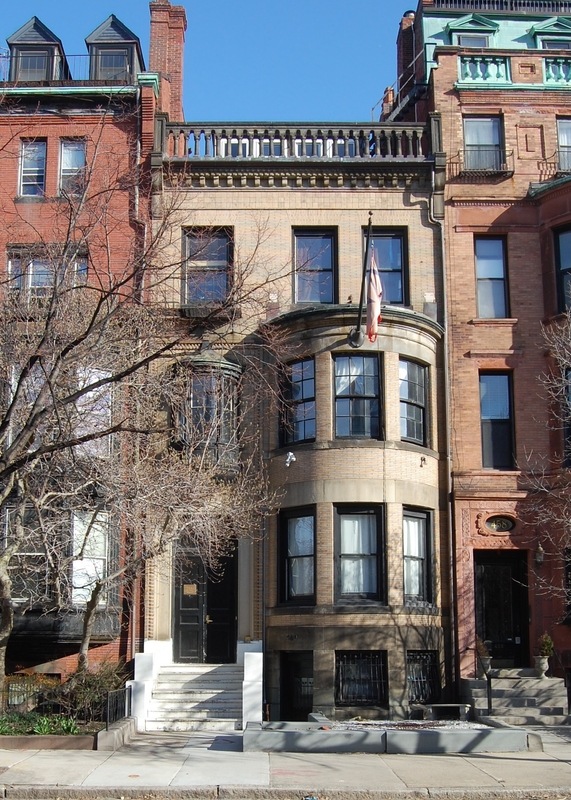 460 Beacon was designed by architect Francis R. Allen of Allen and Kenway, and built in 1891-1892 by Connery & Wentworth, masons and builders, as the home of wholesale lumber merchant George Howe Davenport and his wife, Camilla H. (Chace) Davenport. He shown as the owner of 460 Beacon on the original building permit application, dated April 16, 1891. George Davenport purchased the land for 460 Beacon on August 1, 1890, from real estate investor Nathan Matthews. It was part of a larger parcel Nathan Matthews had purchased on the same day from the Boston and Roxbury Mill Corporation. The deeds from the Boston and Roxbury Mill Corporation for the land between Hereford and Massachusetts Avenue included language specifying that only dwellings and associated outbuildings (including stables) could be built on the land and that the buildings were to be set back 20 feet from Beacon. 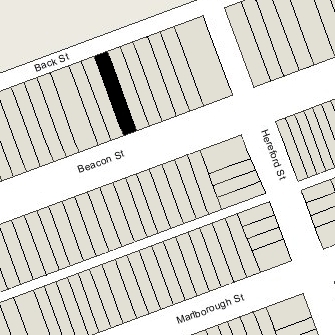 The deeds for the land between 460 Beacon and Massachusetts Avenue were entered into in the early 1890s and also included restrictions limiting to one story any building in the rear north of a line 90 feet from Beacon. The deeds for the land between Hereford and 458 Beacon, which were from 1886, did not include language limiting buildings in the rear. As a result, the owners of the land at 448-458 Beacon entered into individual agreements to limit the depth of the houses that were built on their land and restrict the height of outbuildings in the rear to one story. 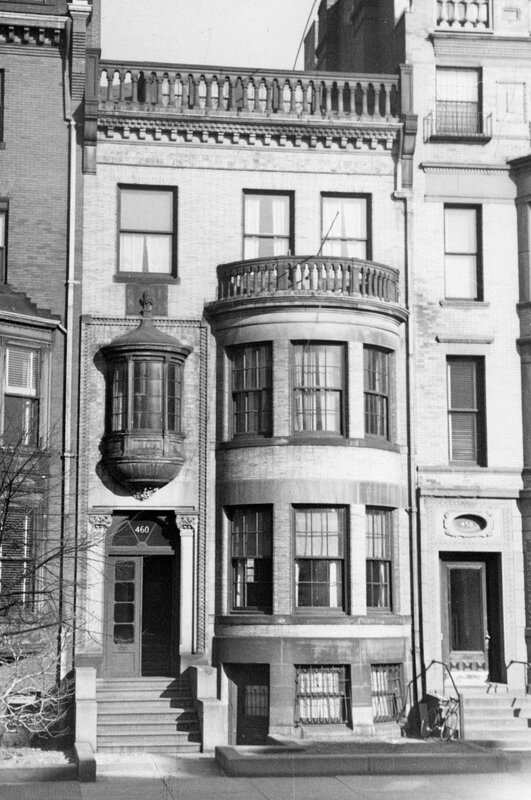 On August 2, 1909, all of the owners of the property on the north side of Beacon between Hereford and Massachusetts Avenue (other than the Mt. Vernon Church) entered into an agreement to “continue for twenty years longer [to December 31, 1929] the existing freedom from irregular building and obstruction of view which they now enjoy from the rear portion of their houses.” On December 30, 1929, the owners of 448-480 Beacon extended this agreement to expire on December 31, 1939. Click here for an index to the deeds for 460 Beacon, including additional information on the deeds and agreements limiting buildings in the rear of the lot. By the 1892-1893 winter season, George and Camilla (Chace) Davenport had made 460 Beacon their home. They previously had lived at the Hotel Victoria at 273 Dartmouth while awaiting the completion of 460 Beacon, and before that at 192 Marlborough. They also maintained a home in Marblehead. On November 5, 1896, George Davenport transferred 460 Beacon into his wife’s name. In 1899, the Davenports commissioned Peabody and Stearns to design a remodeling of portions of the interior of 460 Beacon. Plans for the remodeling (as well as Allen and Kenway’s original framing plans for 460 Beacon) are included in the Peabody and Stearns Collection in the Boston Public Library’s Arts Department (reference PS/MA.049). George Davenport died in November of 1932. Camilla Davenport continued to live at 460 Beacon until about 1934, noting in the 1934 Blue Book that she would spend the winter at the Ritz Carlton Hotel. By 1935, she had moved to an apartment at 6 Arlington. 460 Beacon was not listed in the 1935-1937 Blue Books and was shown as vacant in the 1935-1937 city directories. On January 21, 1937, 460 Beacon was purchased from Camilla Davenport by real estate dealer Ray C. Johnson, and on the next day he conveyed the property to Mary F. Donlan. On July 9, 1937, 460 Beacon was purchased from Mary Donlan by the Alumni Association of the Nu Delta Chapter (MIT) of Phi Mu Delta, Inc. 460 Beacon subsequently became the Phi Mu Delta fraternity house. It previously had been located at 330 bay State Road and, before that, at 378 Marlborough. In January of 1947, ten years after acquiring the property, it applied for (and subsequently received) permission to legalize its occupancy as a dormitory, making the necessary improvements in egress. In 1977, Nu Delta disaffiliated from the national fraternity and became a stand-alone MIT fraternity. It continued to be located at 460 Beacon. In September of 1999, it applied for (and subsequently received) permission to convert the property into a dormitory and place of assembly. 460 Beacon remained the Nu Delta fraternity house in 2017.